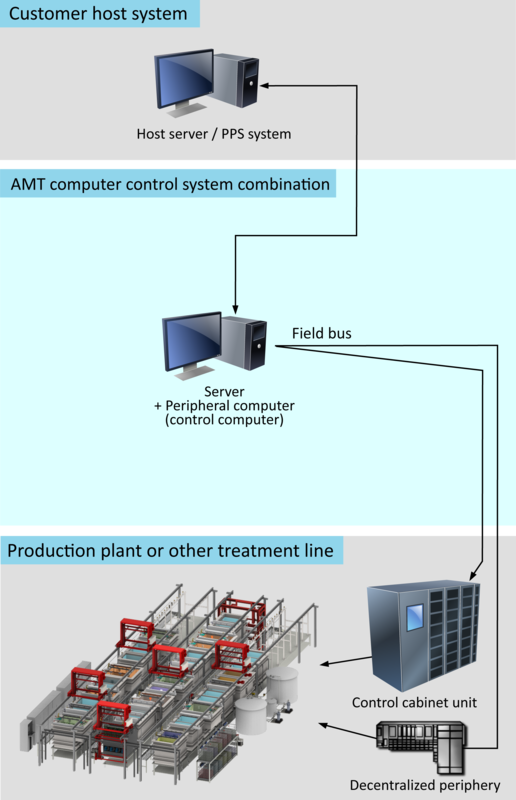 Our control system is based on two basic concepts as a prerequisite for the high availability of the line: division of tasks and redundancy. Control hardware and software are designed on the basis of these principles. Division of control tasks on several hardware system components increases the availability of the line in comparison to a monolithic system. Even the most sophisticated control is subject to an ongoing process of improvements or is frequently modified as permanent adaptation to the customers’ requirements, especially in the start-up phase. Division of control tasks on several components allows partial switching-off, partial updates and the exchange of system components without having to shut down the complete plant. Thus, line data are kept and time-consuming complete new starts can be avoided. Unavoidable interruptions of production can be reduced to an absolute minimum. 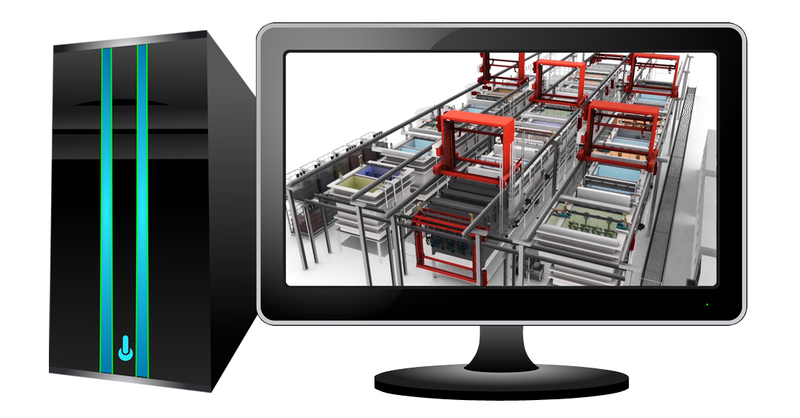 Redundancy in form of identical hardware multiply available in the system allows the distribution of tasks by switching the software during ongoing operation. Thus, operation can be kept running in all cases to virtually 100%. Further security measures are installed, e.g. transport equipment and other periphery is equipped with independent control units. Emergency actions and rescue operations can be executed even if control fails completely. 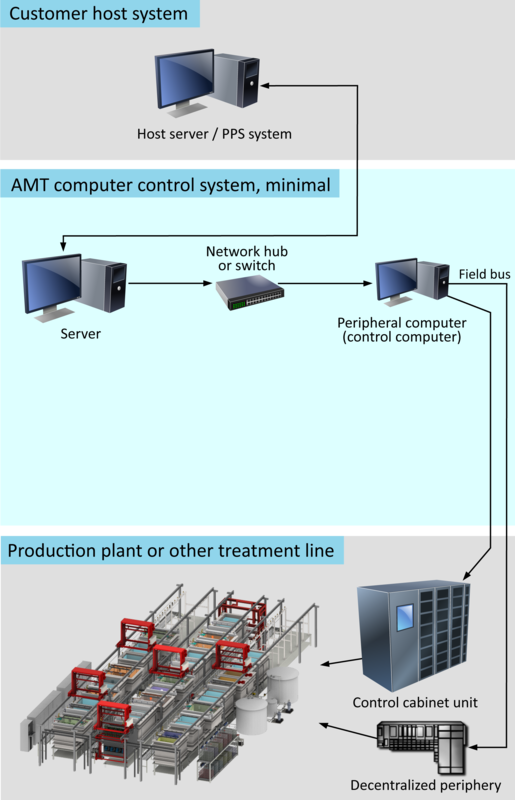 The minimum system consists of two computers (server computer and peripheral computer). Basic measuring, controlling and regulating tasks, independently running control circuits, drive control, positioning, position control etc. are outsourced to the peripheral computer. The server computer contains the complete man-machine interface, order and article management as well as process and drive sequence control. A relational database system controls the centralized data management supplying all other computers within the system with data, too. At a minimum system, the server computer executes all operating tasks. The default system comprises of three computers, i.e. a server computer, a peripheral computer and an additional client computer. Thus, another computer supplement the minimum system. In normal operation, this client computer functions as a fully graphic terminal for data viewing and operation of the line with the same functions and access options as the server computer. Therefore, the server computer is spared operating tasks and can be installed together with the peripheral computer in a safe place without operator access. This way, the core of the system is protected. Software and hardware of the client computer are identical to those of the server computer. All server data are mirrored and thus available on the client, and they can be restored any time in case data got lost. In case of error, e.g. at failure of server PC or peripheral computer, one of the so far clients is simply reconfigured to become server or peripheral computer. This provides redundancy and reliability. An internal observation program automatically executes the reconfiguration and new start of the reconfigured computer as soon as the failure is detected. It could not be easier. The default system comprises of several computers, i.e. a server computer, a peripheral computer and any number of client computers. These clients can be added to the system in the desired number. Thus, loading and unloading stations, test stations, pump stations or waste water equipment get their own operating places according to demand. Each client – as in the default system – can execute the server’s tasks in case of server failure. Here again, server data are mirrored on all clients. Client PCs are used at the customer’s will. Each upgrading can subsequently be executed at any time. All computers in the system are connected to a centralized, relational database administered by the server. This way, all line data are immediately at disposal on each subsequently connected client, without further action. Naturally, the system’s tasks are automatically distributed to the available computers, too, in case of failure. This is the single computer variant and thus the smallest and most cost-effective variant of the computer system. Just one PC executes all control tasks. However, this concerns only the used hardware; the modular structure of the software is the same as with large systems. This configuration is used for small and smallest systems or for single-machine controls. For controlling single machines, often connected to a compact PC format, this configuration is a so-called “Embedded” system; e.g. 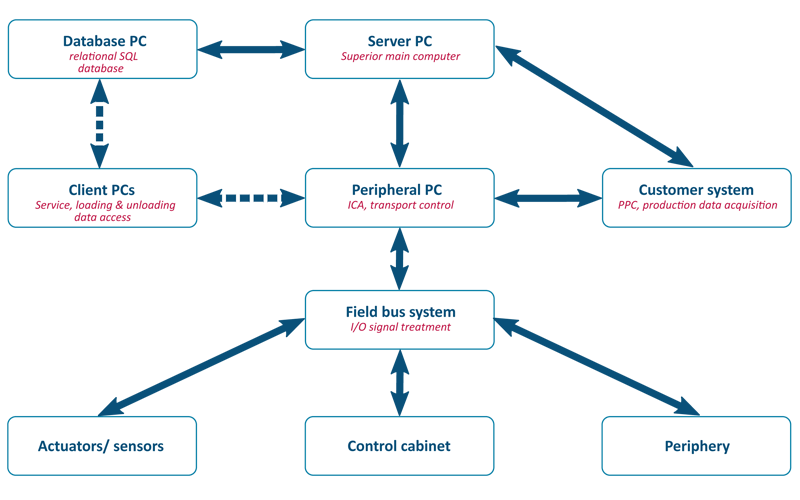 as alternative to an independent PLC control with the advantage of higher flexibility, an essentially sophisticated graphic user interface, substantially larger user-friendliness and lower costs. Thereby, a path is kept open to extent the combined solution to a larger system.